A couple of weeks ago I had a request from Ava to make Snow White, today Ava is being a bridesmaid so thought this would be the perfect opportunity. It has taken me a few weeks to work out a design I actually like with this Snow White, I am still not sure about her face but its not too bad. 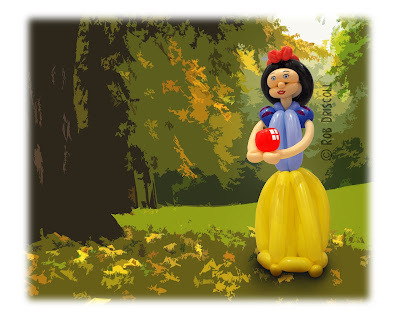 This Snow White is made from 11 balloons, first I made her face and hair from 2 x 260 balloons, then I added the bow out of 1 x 160 balloons, her body came next, this was a 260. I next made her arms and sleeves from a 350 and a 160, I then added this to the body and used a little bit of left over arm to make her nose. The next step was her yellow dress from 3 x 260 balloons, the final thing to do was make her apple, this was from a 350 and a little bit of 260 for the stalk.